Dr. Bryon, (pictured below with friend Kelly Peters) an avid runner, suffered a serious upper spinal cord injury several years ago. He has undergone two surgeries and had to relearn to walk after each surgery. 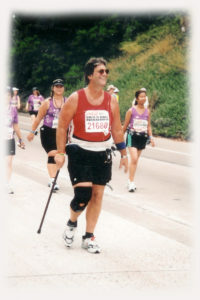 He currently walks with a cane due to balance difficulties and wears arm/hand braces, but will attempt to complete his sixth straight Carlsbad Marathon on January 21, 2007. He is the one who wears the cool red lobster hat during the marathons! Although he has been forced to retire from his busy practice in Anesthesiology Medicine because of the coordination problems caused by the spinal cord injury, he has found an incredible life as a community servant/volunteer. He founded and led the Ellen Browning Scripps Elementary School Safety Patrol for four years; he tutors math and reading; he’s the CubMaster of the largest Cub Scout Pack in the District; he helps coach P.E., soccer, and baseball; he has received multiple awards from the San Diego City Schools, Scripps Ranch Civic Association, and the Boy Scouts of America; he teaches Sunday School; and he has received commendations from the San Diego County Board of Supervisors and the California State Senate for his work with the Cedar Fire Recovery. Tom Burke has been a loyal participant of the Carlsbad Marathon since 1992. He has never run nor walked the marathon, but he manages one of the largest and most enthusiastic water stations on the course. His consistence and loyalty to the event is matched by his love for his daughter, Michelle. 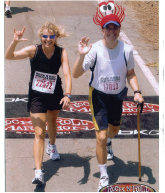 Tom first became involved with the marathon when Michelle was diagnosed with Retinitis Pigmentosa, a hereditary degenerative disease of the retina, leading to progressive blindness. He wanted do something to make more people aware of this disease and bring attention to the need for funding for research. Currently there is no cure for Retinitis Pigmentosa and only limited vision aids available to enhance the vision and retard the deterioration of the patient’s sight. In 1992, he approached In Motion and asked if there was a way he could use the Carlsbad Marathon to help him spread the word. Because of Tom, Retinitis Pigmentosa became an official charity of the Carlsbad Marathon and Tom became the manager of the water station at Carlsbad Boulevard and La Costa. Tom never gives up. 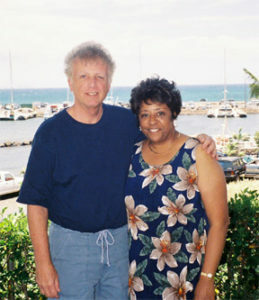 This past summer while on a work assignment in Sacramento, Tom suffered a devastating stroke. He was away from his family, staying in a rented apartment during the week, only going home on weekends. When this happened, he was not able to call for help and it was many hours before Tom was discovered and rushed to the hospital where he was treated for the next three months. Tom will be at his usual post directing over 100 of his friends as they serve water and Ultima to the marathoners passing by. When you go by, take a minute to say “hello” to a “True Marathon Hero.” Just look for the guy with the broad smile and the friendly wave. That’s Tom! “I am doing this marathon on behalf of the American Stroke Association (Train To End Strokes). I have had four strokes in the past and I’m currently on chemotherapy for liver disease (which is causing me to use a cane). I will be starting at 5:30 a.m. with the walkers though I do hope to be able to run some. A little over two years ago I was mailed a flier from the American Stroke Association. Not believing I could complete a marathon, I joined the team in the hopes of completing at least one half marathon and have completed three since then. 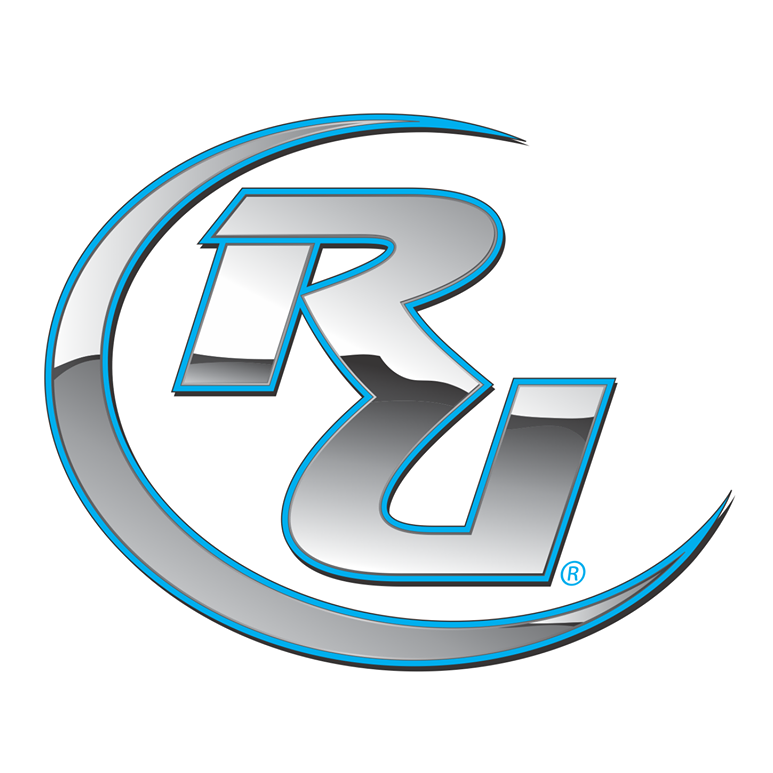 I am doing this marathon to not only expand the awareness of the causes and dangers of strokes, but also to participate with people who are giving up their time to train and eventually compete in marathons for an extremely worthy cause. These fine people give up their Saturday mornings for four months of training and collect donations to help end the threat of death and impairment from strokes forever. I consider myself very lucky to be part of this organization and this first marathon of many more to come. “My first marathon was run for the Team in Training program in 1999 and I was truly blessed to have the Rocky Mountain Chapter of the Leukemia and Lymphoma Society assign Kelly Grubb as my patient honoree. 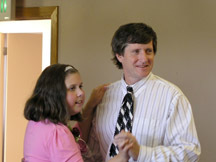 Kelly was originally diagnosed with Acute Lymphocytic Leukemia in 1996. She has endured several relapses, a bone marrow transplant with another relapse, and in 2002 made medical history as the first pediatric patient in the nation to receive a mismatched stem cell transplant. Kelly remained cancer-free and was approaching the all important 5-year anniversary date when her cancer inexplicably returned yet again. Only weeks from what I’d hoped would be a carefree celebration of her 18th birthday, she found herself fighting this disease once again, and Kelly and her family have to leave their home in Montana again to start treatment in Seattle, Washington. Throughout the years I have known Kelly, she has never once complained about her setbacks. She is always positive and fights this horrible disease with unbelievable courage and dignity. She has been an inspiration in my life and is also someone I look up to as a role model. She is an amazing person. Her strength and compassion for others is remarkable. She has touched my life and so many others during her cancer journey. I will once again be running in her honor on January 21, 2007 at the Carlsbad Marathon. She is truly my hero and it will be an honor to dedicate this marathon to her. Debbie Corradini is a marathon hero. She is a forty-three year old mother of two girls, one of whom is a special needs child. Marissa, now 12, was born with a genetic disorder called Cardiofaciocutaneous Syndrome (CFC). This is an extremely rare disorder, with less than a hundred diagnosed cases. Doctors gave Marissa little chance for a long life as she suffered from failure to thrive, a hole in her heart, psychomotor deficits and mental retardation. Debbie threw all of her energy into supporting her girls’ needs. She battled to get her special needs daughter Marissa, the professional care she needed, and worked hard to keep her daughter, Presley, as normal and grounded as possible. Debbie’s love and nurturing have led Marissa to achieve what doctors said she could not — to walk and to talk! 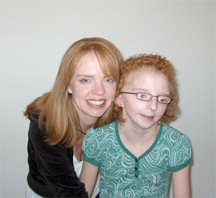 Marissa has even made great progress in swimming, thanks to the loving support of her mom, who never gave up on her. Debbie took up running to fight stress about four years ago. She slowly began seeing progress, never gave up on herself, and completed four half-marathons in the next few years. The Carlsbad Marathon is her first attempt at a full marathon. She has trained hard; juggling a career as a court reporter, mom, wife and runner. Debbie’s husband Steve, and daughters Presley and Marissa, will be at the finish line to cheer her on just as she has supported each of them in their extracurricular activities. Debbie is a true example that you can follow your dreams and achieve your goals if you put your mind to it. 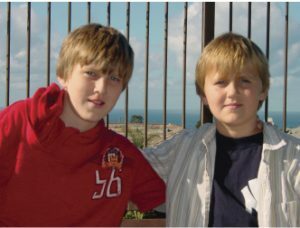 Connor Hume, age 10, (pictured left with with his younger brother) is the youngest Hero of the Marathon. Connor has shown such courage and strength in the face of adversity. He has two younger brothers with serious illnesses; Parker, age 8, has been battling Juvenile Dermatomyositis for over 4 years, and Cole, age 4, was recently diagnosed with Kawasaki Disease and has other multiple health issues. Connor has been the biggest supporter of his brothers, comforting them during their hospital stays, holding their hands when they get shots, pushing their IV poles down the hallways, finding ways to distract them from their pain and knowing just what to say when they are feeling bad. Connor does everything he can to help find a cure for his brother. In fact, Connor said he would give his heart to his brother to save his life. Last year, Connor was an active volunteer for the Carlsbad Marathon. He helped organize and recruit volunteers for Cure JM, stuffed goodie bags for the Cure JM Team, served as a course guide and made signs to cheer on the runners. This year, Connor has recruited a group of friends to walk the first few miles of the half marathon with Parker to show their support of Parker and Cure JM.